To Al, our dockside neighbour with the lovely Hinckley 40’ that he’s been restoring and refitting for the last few years, we present the “Drinks Meister” award, after being refreshed during those hot summer months with several of his “Fou Fou” drink concoctions. Just don’t let him pour the rum. After one particular night of entertaining in our cockpit two unlucky guests (actually, I think Al was one of them) ended up falling off the dock as they left the boat, the other poor person Mike ended up with a dislocated shoulder. Serious RUM drinks! Al has been incredibly generous in loaning us his car and pushbike on many occasions, and helping us out with various projects including manufacturing a bracket for our HF radio antenna. We wish him all the very best with his plans to sail south next fall. Further down the dock, we’ve been blessed to get to know Peter and Pam on “Mischief”, racers and now cruisers (Are you ever not a racer?! 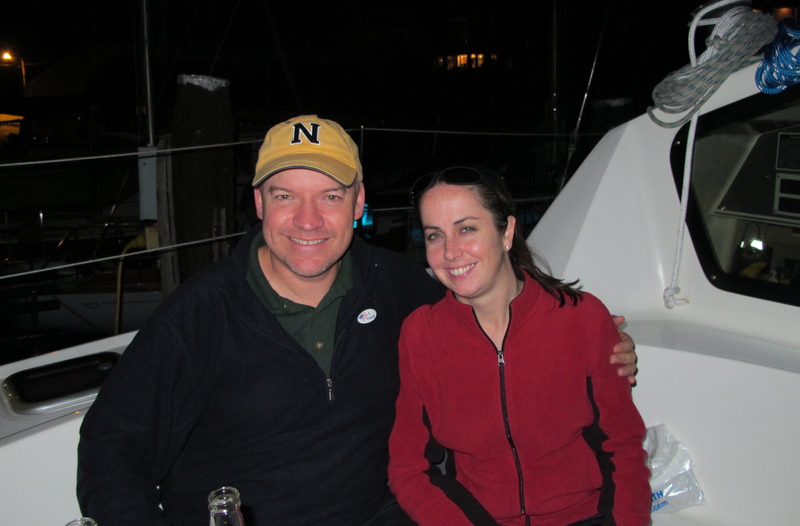 ), who had no idea how desperate we were to get off the dock when they kindly invited us out for a sail. True lifesavers, and wonderfully warm, generous people that I hope will remain friends no matter how far apart we are. They’ve opened their home to us to escape the sweltering summer heat, offered us the use of their laundry, loaned us their car when needed, and we’ve enjoyed many fun times with them. So to Peter and Pam goes the “Saints of Eastport” award! 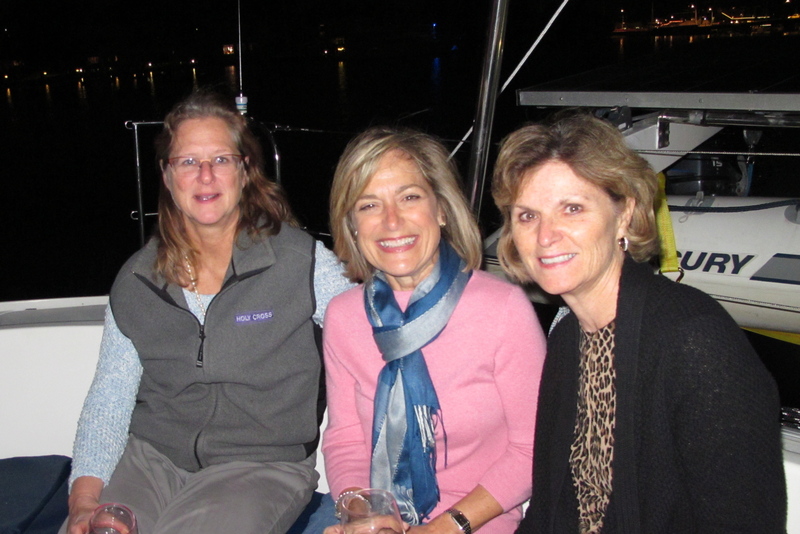 Still on our dock, we have to say a massive thanks to Rod and Lesley on “Huckleberry” – they definitely get the “Hosts with the Mosts” award after inviting us to a fabulous dinner at their beautiful home overlooking the marina. We hope you enjoyed the Barossa Valley “Ball Buster” wine as much as we’ve enjoyed your company! 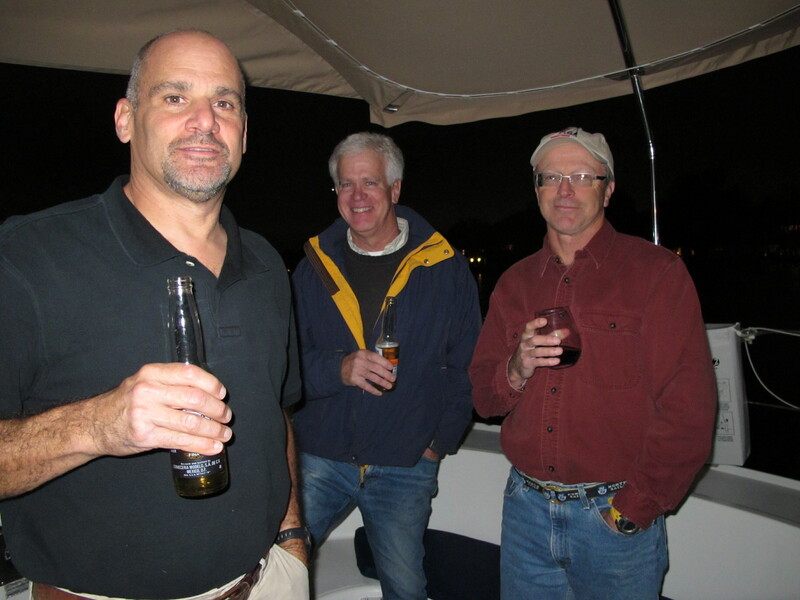 Mike and Rudy – it started out loaning them a few tools to help them get a recalcitrant fuel filter changed on their boat, and ended up with us getting a far better deal by sharing in their incredible crabfest in the “portico” on the marina. 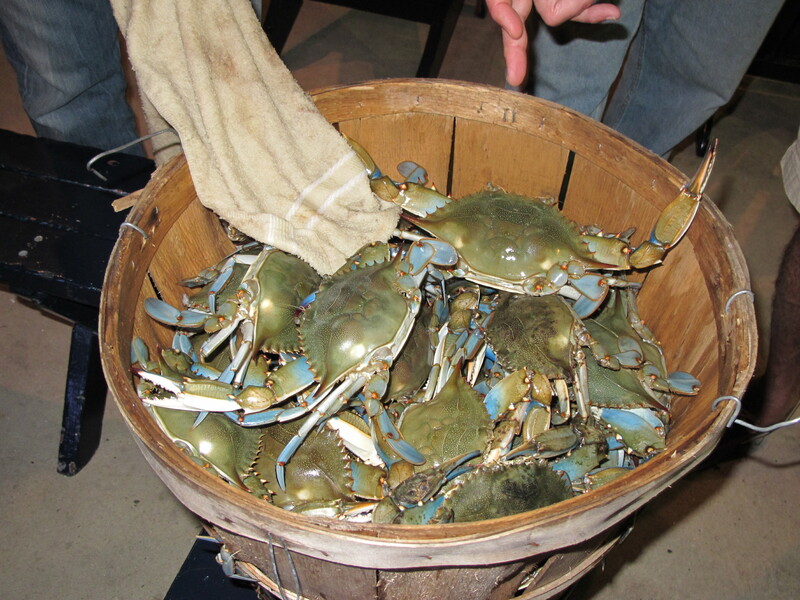 Over 40 crabs caught on a trot-line and steamed there and then on the dock. Oh my, we were in heaven with the door shut! 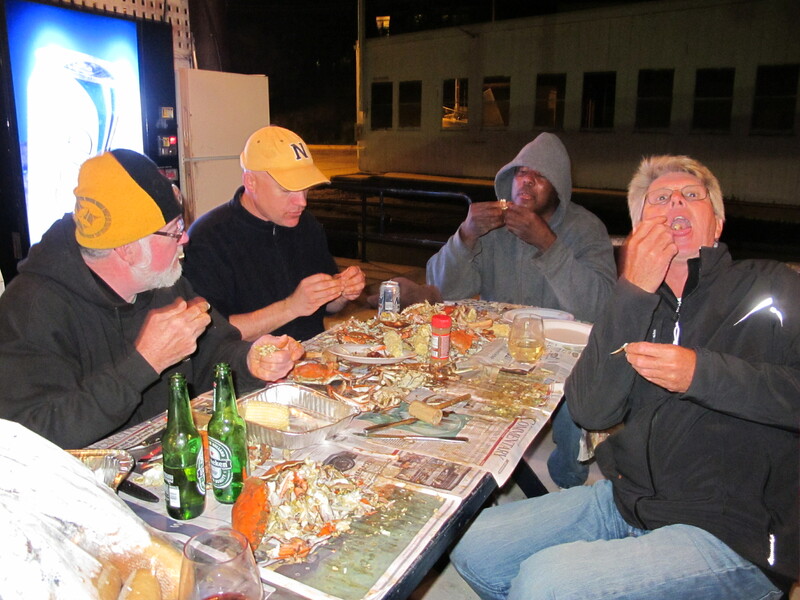 They obviously have to be the worthy recipients of the “Crab Masters Award”. 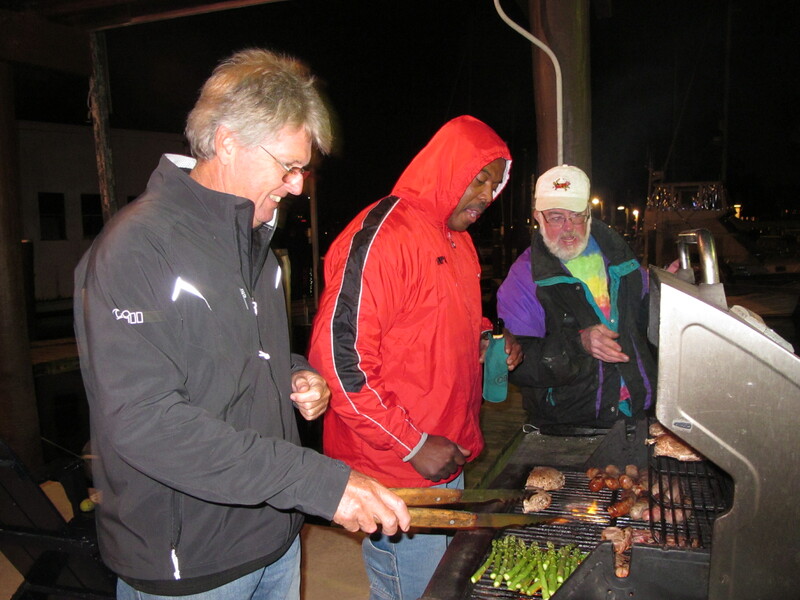 But just to prove their versatility, on our final Sunday night on the marina Mike treated us to an Aussie BBQ, feasting the (cold) night away with lamb chops, steak, sausages, asparagus, onions and mushrooms. You can’t get more gourmet than that! Phil and Gayle (sorry if I spelt your name wrong!) 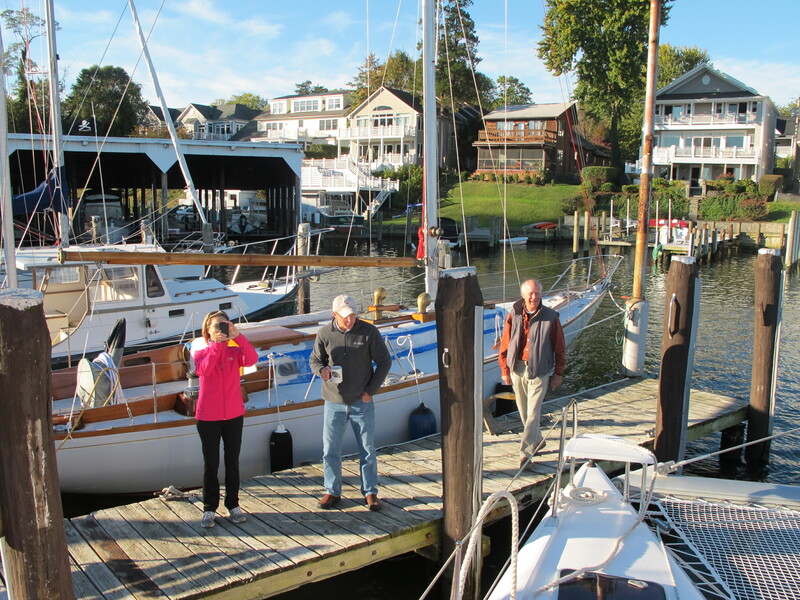 own “Venturous”, a beautiful Southern Wind 72’ yacht that they bought in the Med and brought across to their home port in Annapolis. We enjoyed a great cocktail evening on board and it is indeed a spectacular yacht and very elegant, just like its’ owners. They are a delightful and humble couple and so we would like to honour them with the “Quiet Achievers” award. Keep focused Phil and we expect to see you clear customs in Australia, there’ll be a beer waiting for you! 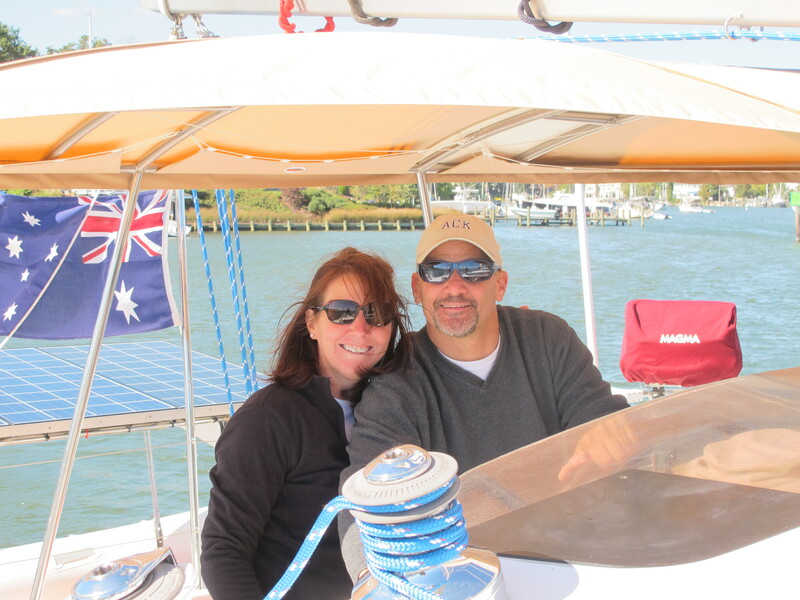 (And thank you both for the delicious pastries you gave us as we left the dock – a very welcome Bon Voyage gift). 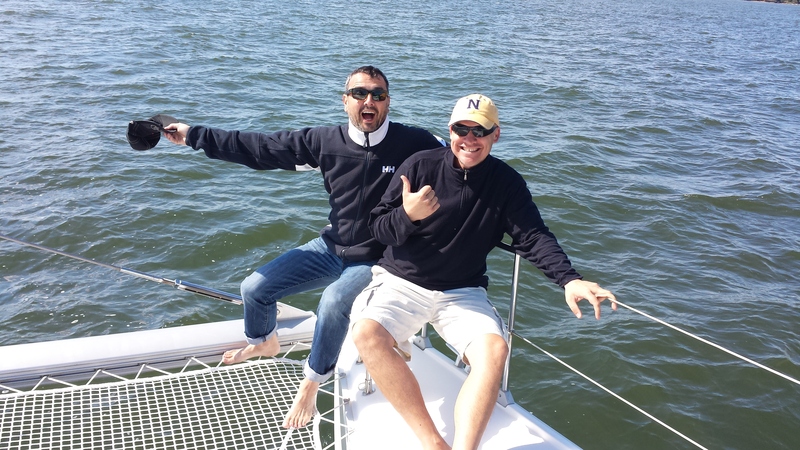 To Ezra, our yacht broker at Annapolis Yacht Centre, we bestow the “Mr Fix-it” award. Ever since we bought the boat last year, Ezra’s been our ‘go-to’ man, helping us with all manner of things related to the boat, suggestions for tradies, acting as our post office, helping us drop off our life-rafts for service (sadly they were condemned, having never been serviced previously). He’s a very busy man so we didn’t get many opportunities to socialize, but we so enjoyed the one glorious summer evening when Ezra materialized at the back of our boat in his speedboat and whisked us off out into the bay and up the river at 50 kts!! What a blast. We ended up at a great waterside bar/restaurant where in order to use the ladies room in the restaurant and having no shoes, I had to borrow Ezra’s size 10 flip-flops. Trying to look casual while flipping and flopping and giggling was not easy. Twas a fun night, thanks Ezra. And last, but not least is Joe. Joe definitely gets the “Man about Town” award. 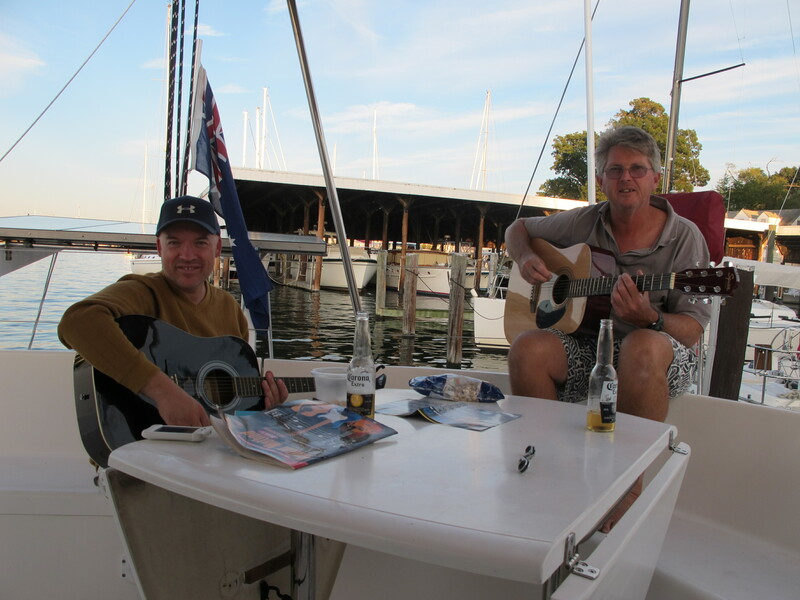 He was one of the first people to come and say g’day to us on the dock, and knows everyone in town it seems. He has a big smile, a big heart, and a big sense of humour and we’ve had so many laughs with him. Early on in the friendship we offered Joe the use of our dinghy when the water taxi failed to arrive one evening. He was going out for the evening with Ashley so we told him to just tie it up at the back of boat when he got back, as we’d probably be asleep. Next morning I get up and there’s no dinghy, but the torch and the kill switch cord are on the cockpit table. No sign of Joe so I went to the shower and on the way back met Joe coming down the dock. “Hey Di, thanks for the loan of the dinghy”. “No problems Joe, glad you had a good night. Just one question, where IS the dinghy?” His look of horror will remain forever etched in my memory. “I tied it up at the back of the boat!”. There then began a rather frantic search for the dinghy which luckily some kind Samaritan kayaker had found floating in the middle of the creek in the early hours of the morning! In fairness to Joe, it wasn’t his fault, the shackle on the dinghy hoist had come apart so it could just as well have happened to us! And then there was the night of Joe’s birthday party when we ended up in a Limousine with Joe and several friends driving up the highway to Baltimore just for the hell of it and drinking Vodka schnapps. Through Joe we got to meet John and his lovely partner Shannon, and Griff and Gwen who all came out on Toucan for a Sunday sail. Joe is also the man responsible for teaching Bruce guitar, so he will either be cursed or revered, not sure which yet! It’s good to hear that you were able to squeeze in some fun in between all the hard work. Great to hear you are on your way. Like the sound of a Fou Fou. Cheers. You would definitely have enjoyed the Fou Fou’s Sherm!